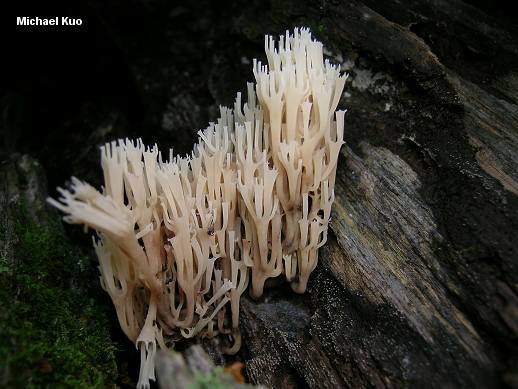 Better known as "Clavicorona pyxidata," this gorgeous and distinctive coral mushroom appears across North America, but is apparently absent (or very rare) on the West Coast. 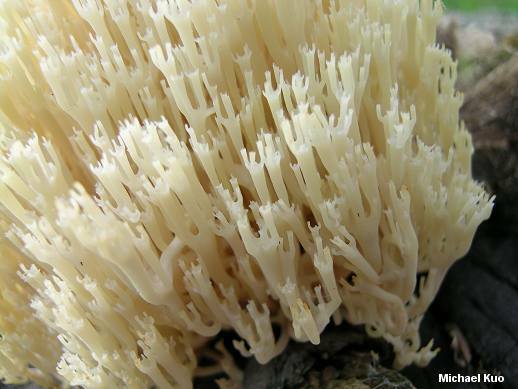 A combination of features makes Artomyces pyxidatus fairly unmistakable: it grows on wood (usually the wood of hardwoods); its colors, when fresh, are whitish to yellowish; and its branch tips are distinctively "crowned," featuring a tiny cuplike depression surrounded by 3-6 points. Microscopic analysis is not required for successful identification, but a trip down Microscope Lane with Artomyces pyxidatus is well worth the time for those who enjoy microscopy; it features cystidia, gloeoplerous hyphae, and amyloid spores. 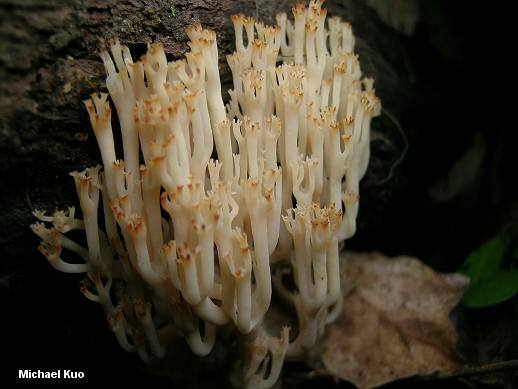 DNA studies have upheld the idea put forth by Jülich (1981) that morphological differences are significant enough to place Clavicorona pyxidata and closely related mushrooms in a separate genus, Artomyces. 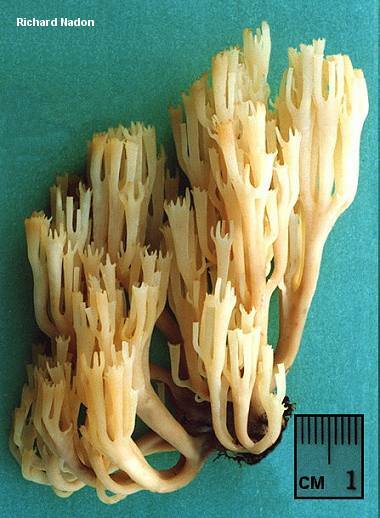 Artomyces pyxidatus has been the subject of much research, and several studies have determined that it is a "biological species" widely distributed across the globe--meaning that specimens from Europe, Asia, and North America can successfully "mate" with one another, at least in the laboratory. 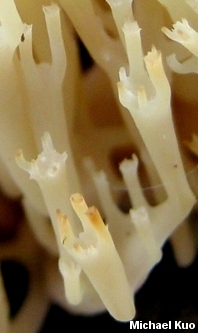 However, Artomyces pyxidatus specimens from different locations on the globe do demonstrate differences in their DNA. Lickey, Hughes & Petersen (2002) found three clearly defined, genetically distinct groups of Artomyces pyxidatus--from 1) China, Sweden and Russia, 2) Central America, Mexico and the southern United States, and 3) the northeastern United States. The fact that the specimens studied by Lickey, Hughes & Petersen were able to "mate" despite displaying genetic difference may lend support to the idea put forth by Taylor and collaborators (2000) that some fungi may be "genetically isolated in nature, but . . . retain the ancestral character of interbreeding." Clavicorona pyxidata is a former name. Ecology: Saprobic; growing alone or gregariously on the dead wood of hardwoods (especially the wood of aspens, tulip trees, willows, and maples); spring, summer, and fall; widely distributed in eastern North America, the Rocky Mountains, and Mexico, but absent or rare on the West Coast. Fruiting Body: 4-13 cm high; 2-10 cm wide; repeatedly branched. Branches: 1-5 mm thick; smooth; whitish to pale yellowish at first, sometimes darkening to pale tan or developing pinkish hues; tips crowned with a shallow depression and 3-6 points, colored like the branches or becoming brownish. Base: 1-3 cm long; under 1 cm thick; whitish, pinkish or brownish; finely fuzzy. Flesh: Whitish; fairly tough; pliable. Odor and Taste: Odor not distinctive or "faintly of newly dug potatoes" (Phillips); taste mild or peppery-acrid. Chemical Reactions: Iron salts negative to grayish or brownish on branches and base. Microscopic Features: Spores 4-5 x 2-3 µ; elliptical, with a tiny apiculus; very minutely pitted; amyloid. Basidia four-sterigmate; clavate. Cystidia up to 50 x 9 µ; variously shaped (fusoid, cylindric, capitate, fusoid-ventricose, clavate); often scarcely projecting. Gloeoplerous hyphae 5-8 µ wide; scattered in the subhymenium; occasionally rising to the hymenium to form gloeocystidia. Clamp connections present and easily demonstrated. REFERENCES: (Persoon, 1794) Jülich, 1982. (Fries, 1821; Saccardo, 1888; Coker, 1923; Corner, 1950; Dodd, 1972; Smith, Smith & Weber, 1981; Arora, 1986; States, 1990; Phillips, 1991/2005; Lincoff, 1992; Metzler & Metzler, 1992; Horn, Kay & Abel, 1993; Evenson, 1997; Barron, 1999; Lickey, Hughes & Petersen, 2002; Roody, 2003; McNeil, 2006; Miller & Miller, 2006.) Herb. Kuo 05210404, 05060604, 07030701.